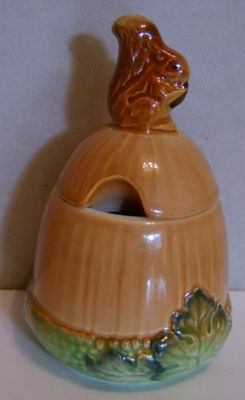 This is a lidded Preserve Pot from Carlton Ware. It was manufactured in the 1950s as a preserve pot in the shape of an Acorn with a small squirrel sitting atop the lid, nibbling at a nut. The Pot stands about 4.25 inches (10.5 cms) tall with a base diameter of 2 inches (5 cms). It is in excellent condition. The main body is a medium brown set on a green, flowered base.